The Health Service Journal has reported that Greater Huddersfield Clinical Commissioning Group and North Kirklees Clinical Commissioning Group have finally announced that they have awarded the £285m/£238m (various accounts of the value) contract for Care Closer to Home community health services to Locala, the company that took over Kirklees’ NHS community health services in 2010, under New Labour’s Transforming Community Services scheme. The CCGs’ Governing Bodies agreed in mid-May to award the contract to the preferred bidder. The mandatory 10 day standstill ended on 27th May. During the standstill, the identity of the organisation that has been awarded the contract cannot be announced, in order to give time for the losing bidder to challenge the decision. Although the standstill should have ended on 27th May, it is still in place and Plain Speakers’s requests for info have been met with the answer that the CCGs will spill the beans in due course. The Care Closer to Home scheme is part of the contentious proposals to cut and close Calderdale and Huddersfield hospital services, that were supposed to be subject to public consultation last September, but that the Clinical Commissioning Groups decided to postpone in the face of big public opposition to the hospital cuts and closures, while speeding ahead with carrying out their proposals to move hospital services into the ‘community’. This entry was posted in Social fairness and tagged Care Closer to Home, CHFT, Locala by jenny. Bookmark the permalink. It is utterly disgraceful that some how the old PCT bosses managed to win this multi million contract closer to home services in the name of Locala. Now we should watch who will be on the Board, directors and their pay and bonuses. No wonder that the old PCT bosses managed and manipulated to appointed CCG board rather than by election. Now they basketed a big reward! God bless appointed CCG board! It was to be expected. The CCG’s are hell bent on distorting the NHS. This decision will further weaken the hospital trusts financial position and hence we can expect the cuts we saw proposed last. 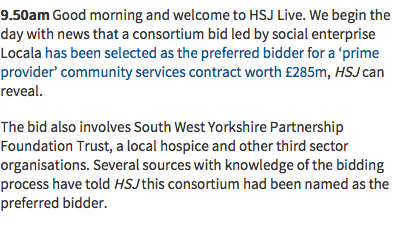 Very sad day for Kirklees, the staff at Locala and the NHS. I should say neither of the CCGs, nor Locala, nor CHFT have confirmed this – who knows how the Health Service Journal got hold of the news?